Born April 9.1947 in Ulan-Ude, Buryatia, USSR. 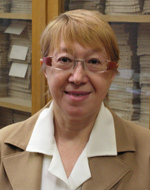 In 1970 R.Krapivina graduated from Belorussian State University (Minsk, Belorussia) with MA degree on History. 1970-1972 - a Teaching assistant to Professor of Philosophy at Technological Institute of Ulan-Ude. In 1972-1980 - a researcher into the History of Buddhism in Russia at the Institute of Social Sciences (Ulan-Ude branch) of the Academy of Sciences of the USSR. From 1980 up to present - a senior researcher in Tibetology at the St. Petersburg Branch of the Institute of Oriental Studies, the Russian Academy of Sciences. In 1983 R.Krapivina received the Ph.D. degree in Tibetan Studies from the Institute of Oriental Studies of the USSR Academy of Sciences, the title of the Thesis is “The Treatise by Sonam Tsemo ‘The Door to Dharma’”. In 1991-1993 she studied at the College of Himalayan Studies of the Tribhoovan University (Kathmandu, Nepal) and received Certificate of efficiency in Spoken Tibetan. In 1995-2005 she taught Tibetan at St.Petersburg University, the Department of Asian and African Studies. In 1993-2005 she acted as a permanent interpreter for the Tibetan Geshe Ven. Jamyang Khentse, who teaches Buddhism in St. Petersburg. From 2006 up to present - a lecturer in Tibetan language and literature at Russian State University for the Humanities (Moscow). Fields of special interest: the history of Tibetan school Saskya, Buddhist philosophy.